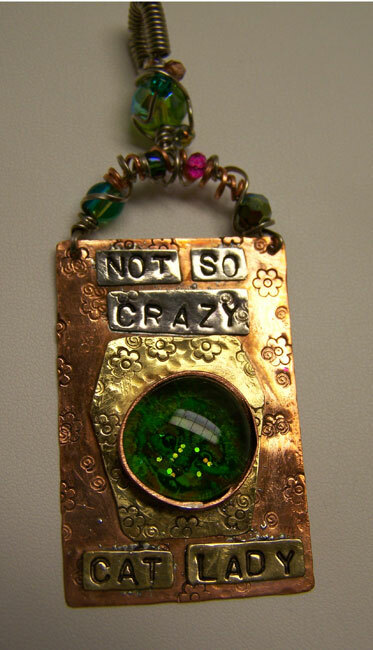 Here's another little "kitty under glass," a grinning Cheshire cat face in a copper bezel under green glass, mounted on a stamped brass, copper and nickel silver pendant. The main piece is 1 1/2" x 2", excluding the bail length. It's stamped on the back with my jeweler's mark, and I've used a special varnish to preserve the shine...purr-fect for any Cat Lady! The 3/8" bail will accomodate a ribbon, thong, or chain.